While Transformers: Dark of the Moon has been in theaters for only a few weeks, it is almost set to cross the $1 Billion earning mark, and that's before it's even been released in Japan. I think that means they are going to make another baker's dozen of the things, so it should be a rocking 20 years! Well, new toys keep trickling out to stores as you would rightly imagine, and Target has unleashed a new checklane endcap of their 4 new exclusive deluxe figures. While of course we have Bumblebee and Jazz (not so exciting), we also have Arcee with a crazy new 'sidecar' that acts as a stand for the strangely designed figure. But the real capstone of the set is Space Case - and of course he ends up being astonishingly short packed! 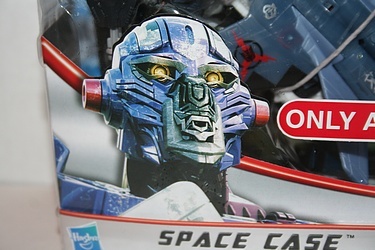 Of the massive display I found one morning, which looked untouched, there were only 2 Space Case figure. Maybe it's the case of the sneaky stock boy! Well, click through to see more about this fantastic, crazy figure!